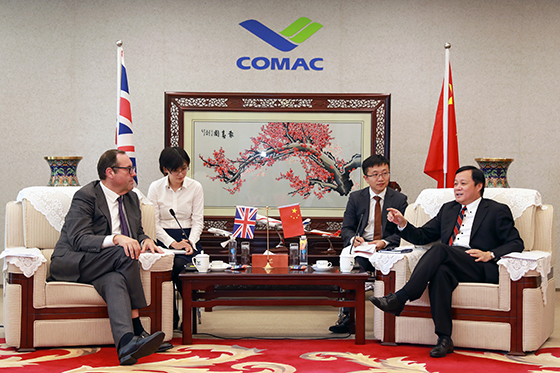 Mr. Richard Harrington, Parliamentary Under Secretary of State at the Department for Business, Energy and Industrial Strategy, visits COMAC__Commercial Aircraft Corporation of China, Ltd.
Mr. He Dongfeng, Chairman of Commercial Aircraft Corporation of China, Ltd. (COMAC), met with Mr. Richard Harrington, Parliamentary Under Secretary of State at the Department for Business, Energy and Industrial Strategy, and his delegation on August 7th, 2018. Mr. Zhou Xinmin, Vice President of COMAC, attended the meeting.